UVc is a recommended accessory for your BSC or laminar flow bench when working with cell cultures, PCR or other genetic materials because UVc radiation is efficient at breaking up chemical bonds and denaturing DNA and RNA. Under prolonged exposure, these chemical changes lead to dysfunctional genetic material and eventual cell death. Germicidal lamps use low energy radiation—so low that the waves are incapable of penetrating barriers or of reflecting from most surfaces. This simply means that for UV lamps to be effective, the target MUST be in direct line of sight with the light source. This is bad if you are using a germicidal lamp as the primary decontaminant in your lab’s culture enclosure. However, for those folks populating the lab or standing outside of the enclosure with nothing but a sheet of glass between them and the blue tube of light, this is a good thing. It means that sheet of glass is more than sufficient to block you from becoming irradiated. Use of a UV lamp for the purpose of primary decontamination is rampant, as is the frequency of cross contamination. True, cross contamination can be caused by a number of factors – but experience shows that labs utilizing UV lamps as the only means of “cleaning” their BSC have a higher prevalence of such issues. If you are using “naked” DNA / RNA or performing PCR... UV lamps are excellent at rendering these materials harmless. 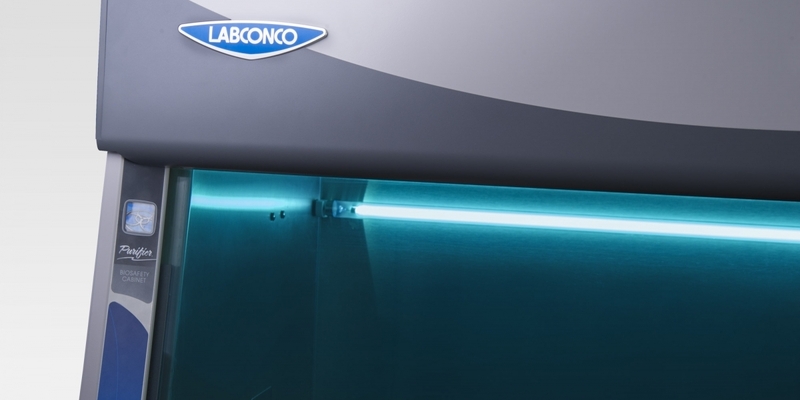 If you are doing anything else with biological material… do not rely on UV lamps alone to keep your work area clean. ALWAYS wipe down exposed surfaces with a proper decontaminant PRIOR to turning on the UV lamp. ALWAYS wipe down exposed surfaces with a proper decontamination AFTER turning off the UV lamp. Learn about the new Type C1 biosafety cabinet. It does the work of an A2 and a B2 at a lower cost of ownership.